Isn’t this just the cutest idea? In full disclosure, this idea is not original to me. I found a garland similar on Pinterest. Make sure you stop by Sondra Lyn At Home and check out her inspiration! Don’t you love to find a DIY project and just know you have to make it? That is exactly how I felt about this project! Thanks so much Sondra Lynn! Here’s Sondra’s leaf garland. So so pretty! I used Sondra Lyn’s idea and styled it to suit my home. That is exactly what I hope you do too! Don’t you love how one fabulous idea can be interpreted differently? When you make this garland (and I hope you do!) put your own personal stamp on it! You can download the template for the leaves HERE. Using the template cut out burlap leaves from the larger maple and oak leaves. And cut out book page leaves using the smaller maple and oak leaves. I also cut out printed burlap leaves but ended up not using them. Use a long length of twine for the garland. Tie the clothespins onto the twine at the neck of the clothespins. I used 5 inch intervals of twine between clothespins. 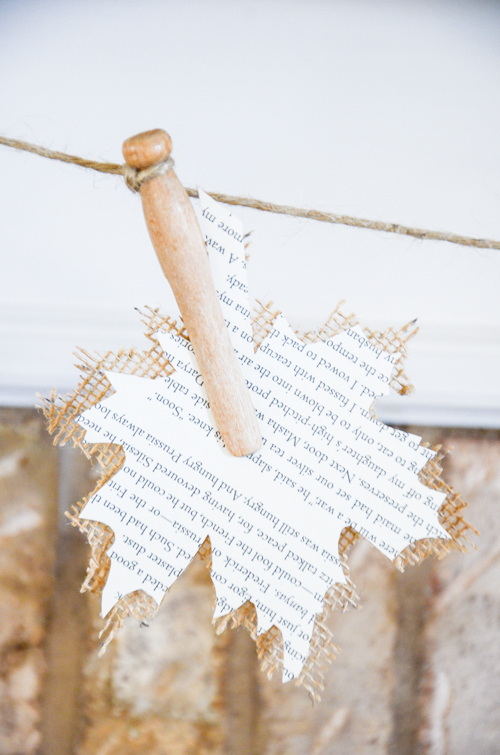 Pair burlap leaves with their corresponding book page leaves and attach to each clothespin. Because the leaves are too thin for the clothespin to pinch them and hold them, fold a piece of paper behind the leaves and attach. See image. So easy and so many possibilities! I hope you will give this easy and attractive fall garland a try!!! Click on the images to go to amazon to see links and get your supplies. You might like to follow me on Pinterest and see what I’m pinning every day HERE. Oh I love this! In addition to blogging home decor I have been a music teacher for over 20 years. I want to make a similar garland using vintage sheet music to decorate my music room for fall. When I do, I will share at The Scoop! My kind of project, cute and cheap! What a fun project. Now i know what to do with all the wide burlap ribbon I have in my stash. Thanks, and Happy Fall. I love, love, love the creativity, simple, and yet elegant garland. I will try and create this look too, for the fall at our home. Thanks for posting the idea and where to get the supplies! Love this garland!! So easy!! I think I will try my own version!! Thanks Yvonne! So pretty! This would work well with a combination of faux leaves from garlands (the plastic ‘veins’ are easy to remove) and paper leaves. Thanks so much for the leaf template. I love your site! I just love your site. I find something everyday that I love or something new I want to do. The leaves are fabulous! Thanks for all the hard work. For fall, I decorate the window over my kitchen sink with a few mini pumpkins, a sprinkling of small pinecones, and a few tea lights in small glasses. This is a sweet idea to “top” off my display. Thank you. Just bought some burlap the other day. Now I know what to do with it. I like the farmhouse feel of the burlap. My dad used to bring home grain in burlap bags. thanks for the decorating tip and the memories. Great decoration! Thanks for bringing it to us and showing us how to do it! As always, fabulous ideas and inspiration!! Thank you!! I love this idea. So simple, cute and creative. Just goes to show that seasonal decorating doesn’t have to be time intensive or complicated. Thank you for sharing. The garland is such a cute idea and easy to change with each season! Thanks for always sharing something inspirational! Also loved the instructions for painting the white pumpkins and saving old pumpkin stems! Genius!! Love leaves in Fall! Thanks for another neat idea ! What a great idea for fall! 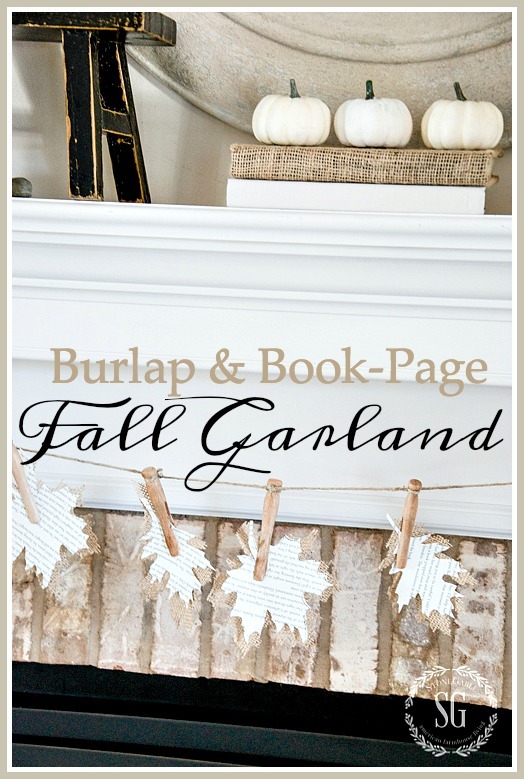 I love that you paired burlap with book pages – it looks great on your neutral fall mantel, too! Looking forward to more fall posts from you…. Happy Weekend! So cute. I love the burlap touches. What a fabulous idea, Tammy! Hug those sweet babies for me too! That is definitely an interesting garland. I would never have thought of it. Need more creativity genes. Will definitely try once. Thanks! Great idea! If you have a leaf die for your die cutting machine this will go even faster and you can do multiples. You are so right Jeri! Great idea, love burlap! Thanks for sharing. Love the “earthiness” of burlap. 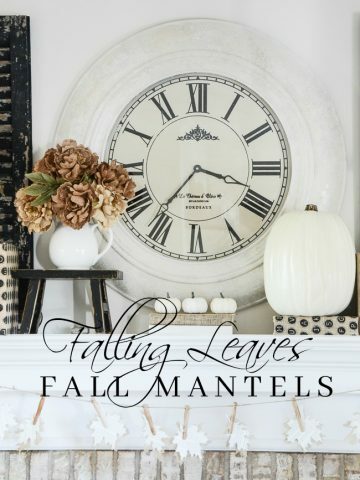 It really says “Fall”. I am always drawn to the graphic nature of book pages, words and typography. 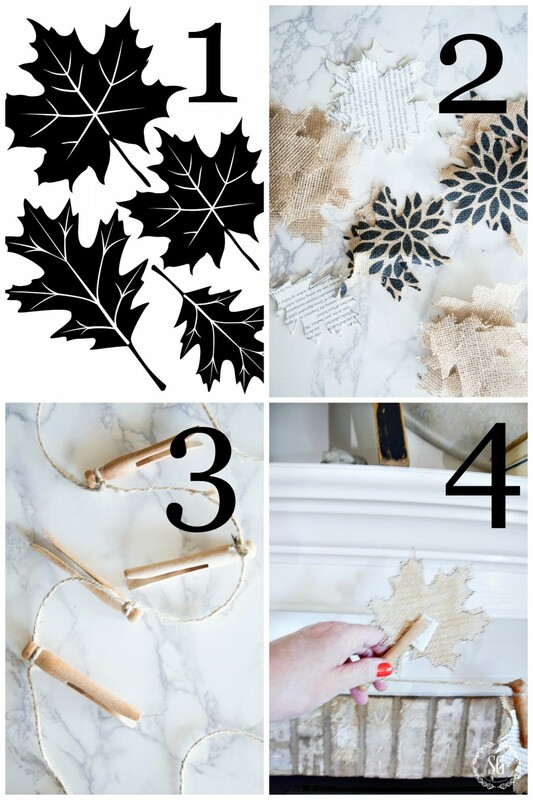 These leaves combine the best of both for a super cute, easy garland! Thanks for sharing the easy instructions. The banner is sooooo cute!! I love the look of the chippy black mixed in with the fall decor in neutrals !!!! Getting some great ideas!! Cute! Love all the quick easy ideas! Like the look and a fun, easy project to do with the grands. Love the way you cover books with burlap…have been look all over my area for the alphabet burlap…no luck finding it. Do you have any idea where I might find some? The leaves is such a cute idea. HI KATHY! I found the type print burlap years ago at JoAnne’s fabric. I know that when I find something like this I scoop it up. Styles change and don’t stay in the stores very long. Your house is always so beautiful, looking forward to the FALL tour. I love you ideas. I also appreciate your suggestions for making our homes more inviting. For some reason, this only gives me the option to save to “box” which is not free. PDF is free, iBooks is free and kindle is free. I have things saved there. But I have my Mom’s book from her teaching days in the 1940’s so I’m fine getting the pattern. What was useful was telling us to use the exact pattern larger behind and adding a folded wad of paper!! I do have orange “shimmer burlap” from a clearance when I had a party several years ago. I think this is a good use for it along with some old newspapers from our original hometown where our family still remained. Sentimental Garland. Thanks for all the tips. I like some DIY. Love the white pumpkins etc. Makes me look so forward to that first cool front. The orange ones can’t be far behind. Love all of your inspirations. Fall is my favorite season too…these Texas Summer’s are so long & hot! Thanks for sharing your wonderful ideas with us. The burlap makes the book page really pop. I really like this idea! Sooo cute! Can’t wait to do the banner!! Thks!! 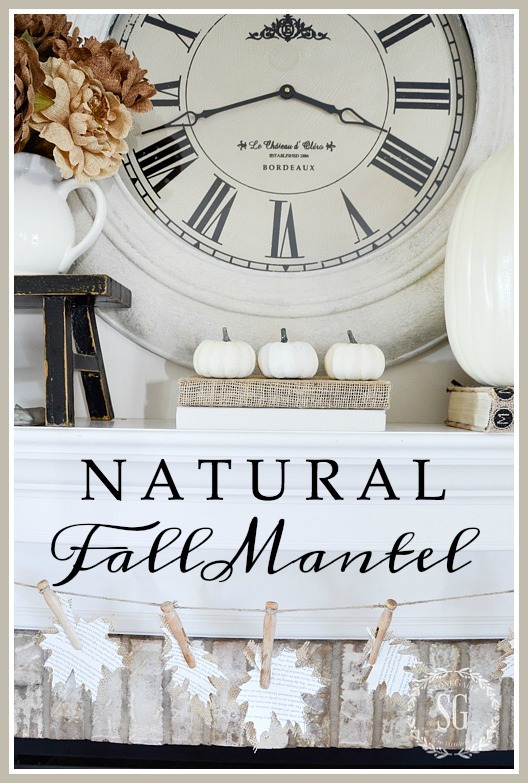 I really like your early fall mantel – especially the white pumpkins! My living room has some pink and black in it so orange just doesn’t go! The white/neutrals would be a much better choice! Two of my favorites – burlap and printed pages – combined for one great look! This is a must make. There’s such beauty in the simplicity of your banner. Love it and it’ll be a snap to make! Love the leaf banner. It would also look great on a hutch! Yay, a project for my granddaughter and me when she visits in a few weeks!! Thinking about making this with my grand girls over this rainy weekend! I love the old fashioned clothes pins! I love the neutral mantel, and the leaf garland. Makes me miss my mantle. 🙁 will have to remember for next house. 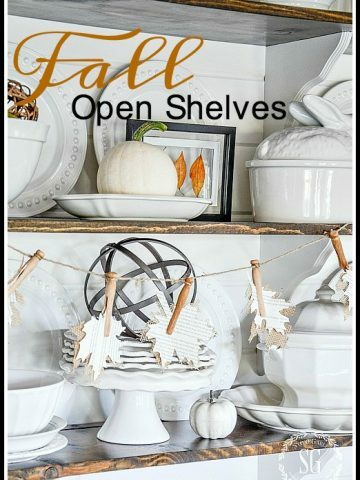 This is a great project for my fall theme in my home this year… simple and inexpensive always hits a home run with me! Thanks for sharing! I like garlands, too, but have never made one. I think I could do this one! I might do the leaves out of fall-colored paper. Thanks for the ideas. Cute idea! This would work well in a classroom, using vocabulary words for the week, too, I think! How cute would that be! Perfect! Something to replace my red, white and blue summer mantel banner! A great idea for my granddaughter’s kindergarten classroom. I love your vintage like fall garland. How cute is that. I like that it is clean yet sophisticated. Please keep these posts coming. I really like this simple but lovely fall banner?? 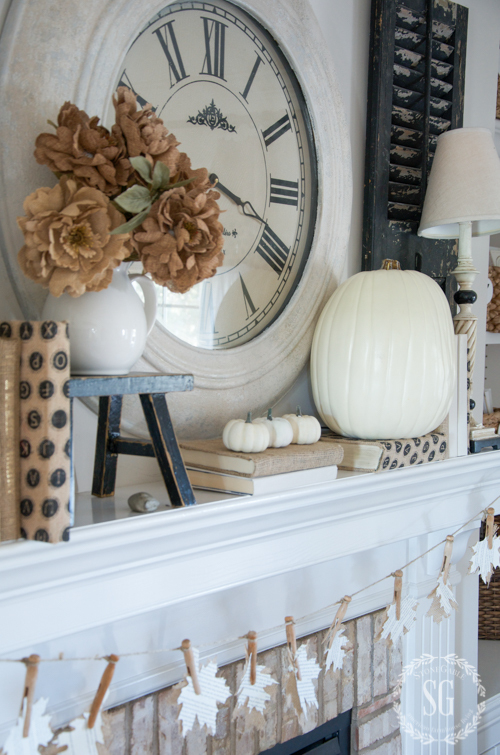 I love the huge clock on the mantle and of course the wonderful white pumpkins.. Always a super display. You inspire me. I’m making knitted pumpkins I found on Pinterest. Also found spray paint to make Mercury glass. There isn’t enough time for everything! This is such a cute, and easy idea for a fall garland. I will be making one for my mantle. I really enjoy all your posts. You have such a wonderful talent. Your blog is full of inspiration, and this is a great project! Such a cute idea! Your decorating ideas and tutorials are wonderful!! Thank you for all the inspiration! Happy Fall? 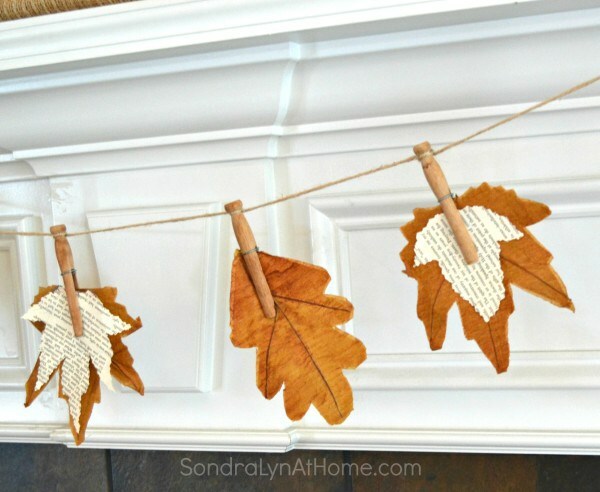 Thanks ,Yvonne for the inspiration.I do not have a mantle,but I do have a plate rail around my dining room and I am going to make this cute fall garland for the dining room. Happy first day of September. I just love everything you do! Simple, tasteful, and beautiful…..and inspiring, of course! Super cute idea !! Love the idea of using burlap with old books ! Very cute and simple. Lots of cutting but worth it…cute Fall garland. So many great ideas from your website. I especially love your Sunday devotionals. The burlap leaves are beautiful and the book covers are great too. Just made these today! Super cute! Oh Tracy! I am so glad you made one too! I love this! I may try to make it this weekend! Love all your fall decor!! Such an inspiration to view your blog each day. Love, love !! Fresh, warm and elegant ! Love all your charming ideas! They are budget friendly and so in style. I love seeing all your beautiful ideas! They are so charming and don’t break the bank. Keep up the good work! I ave to make these. Love this idea since I am a book lover and English teacher! Thanks! I love it, you are so creative, can’t wait for each new post! The leaf garland is adorable. Fall leaves bring good memories and feelings to me. Plus the wooden clothespins add great charm. I love it. I think I’m going to make it this weekend. Thanks! Thanks for the great idea! I am cheating and using some old silk fall leaves as the background, fronted with natural burlap. Then can hang outside on porch. Thank you for providing the leaf template. I love simple inexpensive seasonal decor. Cute, cute, cute! I need to get to work doing some fall decorating. Maybe I’ll add a little shimmer to the edges of the leaves. 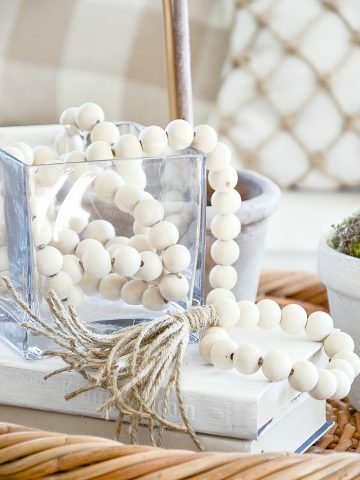 Love, Love, Love the elegant simplicity of this garland. I enjoy so much reading every one of your posts! Love this idea, did you use something to make the burlap stiffer? When I feel frazzled and ready to scream, I sit down at my computer and look for your blog. After I read about your inspirations for home (love the banner)my focus returns to my favorite things. Thank you. So much less expensive than a therapist! Hello! Another great idea! Thanks Yvonne….love the blog and all the great ideas…I do not have a mantle like a few others..but will make the banner on a smaller scale to use on a mirror and one to connect to the two knobs on a top drawer of the television cabinet…whatever works, right? thanks again….and have a lovely rest of the week. 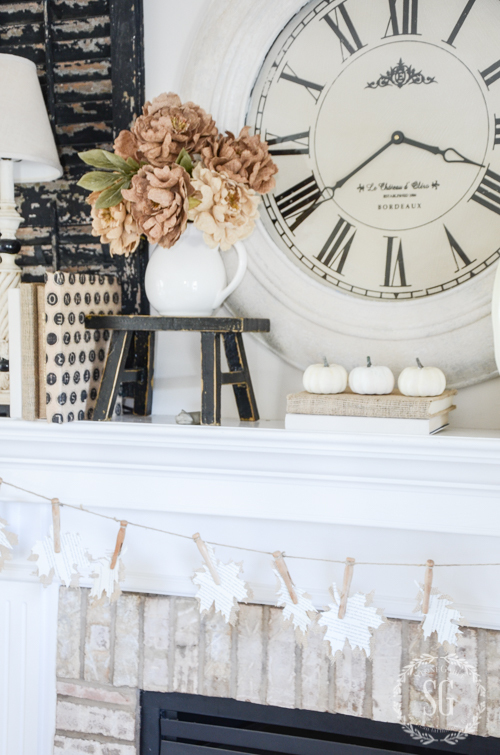 Making sure I check all your fall ideas….my favorite season and love to decorate! You always show some great things. Like you Yvonne, I love fall & all its rich, warm colours. I might just have to add a wee bit more colour, maybe orange or lime green so it is a bit less bland. No offense, I do like what you created & love burlap! Love the little burlap/paper leaf garland. Yvonne, your blog is just wonderful and full of so much goodness. The burlap decor is beautiful. My sister recently made all the decor for her daughters wedding using burlap, metal, wood, mason jars, etc and it wa a fabulous. It looked like something out of a magazine. Thank you for all you do. I love burlap, thank you for the idea! I am supremely flattered that you adapted my book page leaf banner, my friend! I can’t believe you even folded paper to slip into the back of the clothespin! Ha!! When I did that, I thought surely there must be a better way… but I didn’t want to use glue or anything that would damage the clothespins for future projects! Thanks so much for sharing my idea with your readers! Thank you so much for this brilliant idea and sharing it! The folded paper idea was brilliant too! I love this idea…so versatile. I am looking forward to more fall inspiration. Thanks for sharing the banner inspiration. Looks easy enough that even I could do it! Did you whitewash the brick or is that the color of the brick? I have been thinking of doing a whitewash until I can afford to replace the brick, if ever. I love the look of whitewashed brick! We put this brick veneer over green marble tile. If I had brick I’d certainly whitewash it or paint it white! Cute idea if I was having a fall party but It would not fit into my home decor on a daily basis. My style is traditional with emphasis on art. I do love the farmhouse look though. I love the idea using burlap and book pages. It’s good to see old books being recycled into something as cute as this! Yvonne, Thank you for making this sweet project so easy to accomplish. Cute, simple, and just right for a fall mantle. Love love love this idea! I may actually string it outside my front door, if not on the mantle! It will go beautifully with the plan I have for my fall “front porch-scape,” now that I have my first home to decorate! Take care & Happy Fall! Love this! I have some old books I was going to donate, but I think I’ll keep one to make this project. I love that this idea is simple, easy to create, but looks amazing! Hang onto those books. I have a great way to use them on your Christmas tree this year! Love this leaf craft. I plan to hang across my wall near some pictures. Can’t wait for the revealing of the Christmas tree project. You always come up with things I love. Very cute idea! Nothing says Fall like leaves, love the book page print! Take care & Happy Fall to you! Who would think you can do so much with burlap. Wouldn’t our ancestors be amazed. Theres were used practically. I love the print on the leaves. I’m going to have to make this! Very cute! So sweet! 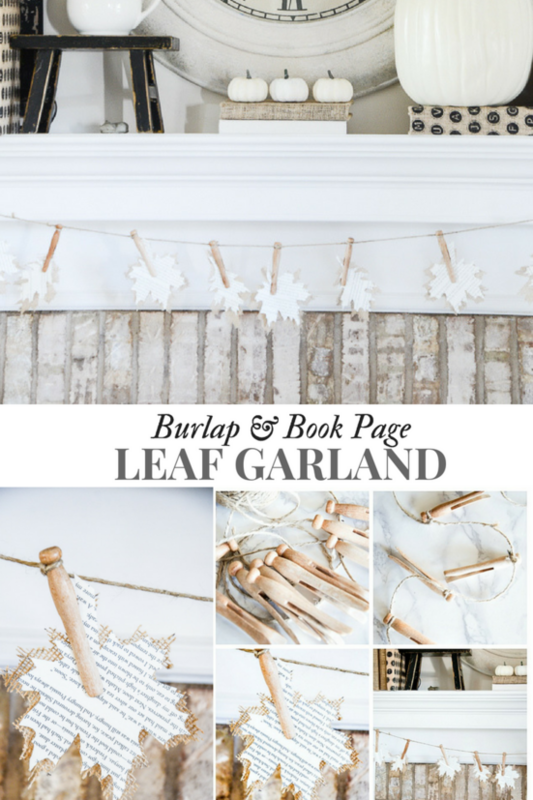 Love the garland – and so easy to make! Dont have a mantle….but plan on using the garland for my chalkboard. Thanks for the inspiration …Have a blessed day! ? Love this simple-beautiful garland. I don’t have a mantel, but I’m thinking I could find another spot!! Your banner is perfect for fall! I actually just finished making a burlap banner with cream sunflowers for the picket on my front porch and I’m eager to put it up! Love the banner. You have such great ideas! So lovely and thanks for sharing the source of your inspiration…I’m going to think about how to make this craft project uniquely my own just like you did, Yvonne. i love the simple ideas you share that have major decorating punch! I even have all the supplies on hand for this one! Thanks for the inspiration! Like the idea of the book print on the leaf. Yvonne, what a cute idea. Thanks for sharing! This would be a great project to make with my kids! I hope that you have a wonderful and blessed day!!! Want to give this a try! The Amazon links do not take me to the actual item, just to Amazon. Did you use burlap ribbon or just burlap fabric? Hi Janice. I used burlap fabric. Hope this helps. Love this idea. I just finished decorating for a baby shower and did a similar display with books and used small cloth spins I got at Hobby Lobby. going to try this with the leaves. Thanks Yvonne!!? I think I will make one for my mantel. I like the look of banners and the easier the better! I really like the burlap with the book page print! Two of my favs together! I’m gonna give this one a try! The jut an natural wood clothespins just scream FALL! Can’t wait to create this garland, thank for the great idea! Cute idea! I will make this to decorate my mantel. I love the burlap idea! Thanks for sharing. Happy Fall! This looks so easy … must try it! Thanks. I am a banner junkie and this is adorable! Very cute idea! Would also be a great project for kids!